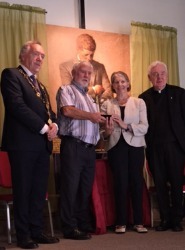 Sr Stan was presented with the 2017 Fitzgerald Bible Bruff Award at the Thomas Fitzgerald Centre in Co. Limerick on Sunday 16th July. The Fitzgerald Family Bible Bruff Award was established in 2015 and promotes the link between Bruff and the Fitzgerald family bible.